Ram Vilas Paswan tabled the Consumer Protection Bill 2015 in the Lok Sabha Monday amid the uproar by Congress members over the Lalit Modi and Vyapam issues. The bill, approved by the Cabinet on July 28, seeks to create a Consumer Protection Authority with powers to recall products and cancel licences of defaulting companies, including e-tailers. 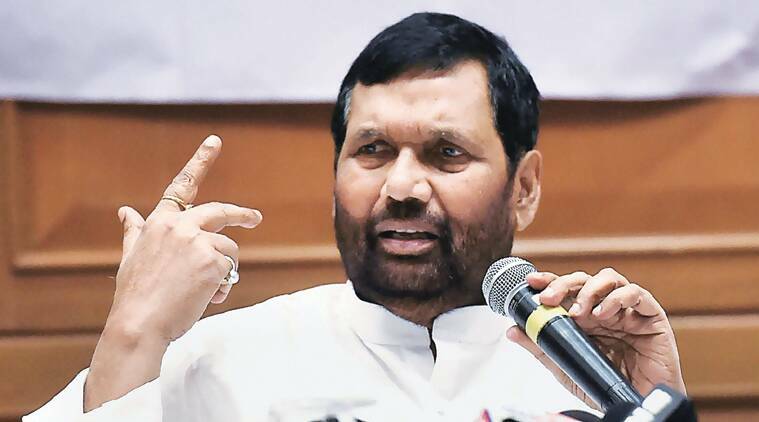 Consumer Affairs Minister Ram Vilas Paswan tabled the Consumer Protection Bill 2015 in the Lok Sabha Monday amid the uproar by Congress members over the Lalit Modi and Vyapam issues. Several MPs too managed to raise matters of public importance despite the ruckus. The bill, approved by the Cabinet on July 28, seeks to create a Consumer Protection Authority with powers to recall products and cancel licences of defaulting companies, including e-tailers. It seeks to replace a 29-year-old law — the Consumer Protection Act of 1986 — and fast-track the redressal of consumer grievances. Among issues during zero hour, BJP MP Ramesh Bidhuri accused the AAP government of Delhi of only indulging in theatrics and not doing anything to deal with the issue of prolonged traffic jams in the national capital, while BJP MP Jagdambika Pal raised the matter relating to self-styled godwoman Radhe Maa and other such figures, demanding stern action against them. A woman in Mumbai has complained to the police that Radhe Maa had instigated her in-laws, who have been her followers for many years, to demand dowry from her. Pal said many such people were facing criminal charges and the government should “take strict action against these fake godmen and women”. BJP MP from Chandigarh Kirron Kher demanded that the government implement One Rank One Pension (OROP) for defence personnel. “OROP is not a question of pride, it is a question of survival,” Kher said. Akali Dal MP Prem Singh Chandumajra highlighted the destruction several villages in his constituency had witnessed because of the release of water from the Bhakra Dam. Trinamool Congress MP Sougata Roy, meanwhile, refused to speak during zero hour, saying, “Since the House is not in order, I would not like to speak”.